Those who start running or walking do not think about the right equipment. They just put on a T-Shirt, running shorts and a pair of runners and off they go! But when they suffer from blistered feet and aching knees after the first run they become aware of the need of a good pair of runners! moveguard:What should health-oriented runners and walkers keep in mind when buying running shoes? Dr. Bettina Schaar:First, it’s very important to choose the right shoe for the particular sport. Runners and walkers should look for a new pair of running shoes in the department for running or walking shoes. Sports shoes which are just fashion accessory or retro models, can’t be used for the training. moveguard:Are there any differences between running and walking shoes? Dr. Bettina Schaar:The main difference is the structure of the shoes, the stability and the used materials. The structure of running shoes is more flexible to carry out the running movement with a flight phase more flexibly. 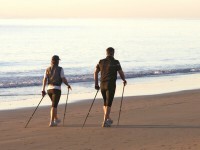 When you walk or do Nordic Walking there is always one foot on the ground, i.e. there’s no flight phase. 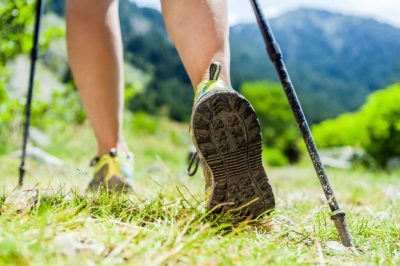 That’s why walking shoes are more stable – this applies to the sole as well as to the support function. moveguard:How can people recognize the right shoe? Dr. Bettina Schaar:There are many different running and walking shoes. There are shoes which are more stable and with a rather thin sole. These shoes are compact and are equipped with a stable damping. Flexible shoes are a bit softer, have a thicker sole and have a higher damping. In general, it’s very important to choose shoes which have a good damping and are stable at the same time to protect the joints. moveguard:There are shoes which support the inner side and/or the outer side of the feet. Does it make sense to buy one of these? Dr. Bettina Schaar:Well, it depends whether your feet turn to the inner or outer side when hitting the ground. That’s why there are shoes which support the inner or outer side of the feet. If you are not sure if your feet turn to the inner or outer side, I recommend to consult an expert in a specialist shop. There you can do a treadmill analysis and/or video analysis. If the expert at the specialist shop finds a faulty foot positioning you should go for a „neutral“ shoe without support function and have a sports insole for the shoe adjusted by an orthopaedic authorized specialist. moveguard:How do I know which type of shoe fits me? Dr. Bettina Schaar:When you want to buy a running or walking shoe it is very important to try on and try out the shoes. Good specialist shops provide tread mills or running tracks. Here your running style with the particular shoe can be analysed with the help of a video analysis. But there are also other biomechanical systems in specialist shops which support you on your search for a new running or walking shoe. So, ask for advice in specialist shops! moveguard:Do you have any other advice concerning running shoes? Dr. Bettina Schaar:If you exercise several times a week, you should consider buying two pair of shoes: one pair with a thicker sole and one with a thinner sole to wear alternately. 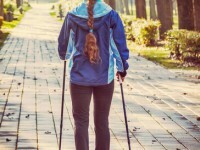 In this way the strain on your feet and joints varies, they are trained differently and you avoid chronic damage. Another important thing to mention: women with very tall feet should try to find women’s shoes in their size instead of buying men’s shoes. Women’s shoes have a tapered rearfoot lasting that fits women’s foot shapes better, i.e. they are more comfortable and fit better. We wish you a great and comfortable run!